Just a quick set up picture since I was fishing out more bases and had all the miniatures on hand. Federation fleet about to be atomized: two DDK, two standard transports, and one passenger liner (which I really ought to repaint). Soon to be victorious Klingon fleet: two E3s, a D6, D7, F5W and F5. 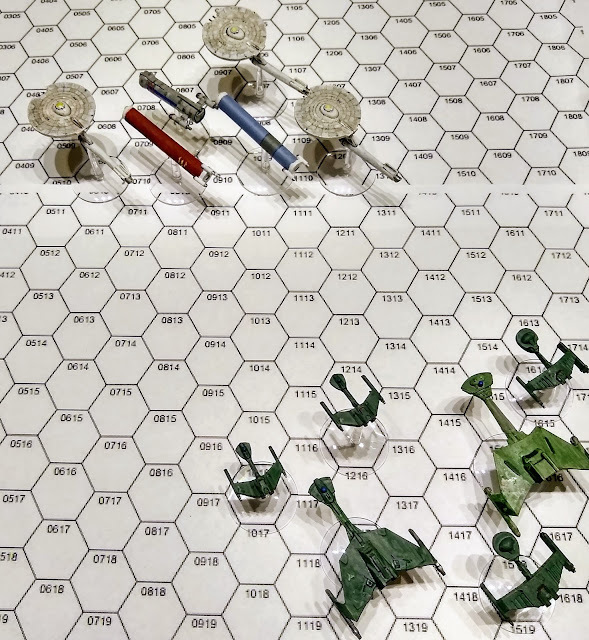 The "game mat" here is just a couple of 11x17" papers, which are just about enough to play test with, but also shows why larger hexes are desirable!